Over 5.8 million people in the UK live in deep poverty meaning they lack access to healthy affordable food. At the same time the UK throws away 3.9 million tonnes of good food is sent for disposal by the food industry every year. We distribute food to over 200 charities and community organisations - our CFMs - and new organisations are joining all the time. Our community food members provide vitally-needed meals, food parcels and snacks to hundreds of disadvantaged people every day. They work with a huge variety of people dealing with hardship, people who are homeless, unemployed, people dealing with substance abuse, the elderly, children, young adults, refugees and asylum-seekers at drop-ins, residential centres, children's centres, and breakfast and after-school clubs. FareShare GM also supplies pantry projects / food sharing clubs. Organisations using food to help people in need are welcome to apply for membership. Once the application is received, a member of the team will get in touch to discuss food needs, membership costs, and arrange a site inspection. At the moment we are keen to here from organisations based in Oldham, Rochdale, Bury, and Wigan. Our waiting list will next be reviewed in May 2017. Our industry partners donate food, money and time. In the last 12 months our food partners delivered over 900 tonnes of fresh, frozen and long-life food to our depot at New Smithfield Market in Manchester. We receive a wide range of food - bread, meat, vegetables, cans, ready-made meals, dairy products, and drinks - we never know exactly what we'll get each week. Some partners deliver every working day, others once or twice a week, others, a few times a year. Together with a large team of invaluable volunteers, our staff respond to membership enquiries, deal with deliveries and store the food in the warehouse. The food is then matched with the needs of our community food members, and delivered. Our aim is to make sure that everything delivered to us by our food partners finds a home. Our industry sponsors organise fund-raising events and give money, staff-time, and even equipment. We keep our costs low by running the service efficiently, but in order to expand the number of people we help we always need more support. To help with fundraising please give us a call on 0161 223 8200 option 4. 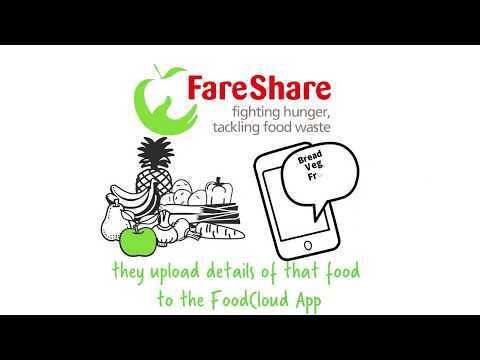 FareShare Greater Manchester is part of the national network of FareShare UK.